"There are secrets hiding in the deep caverns of this music. One of them is that no great art is made without the slaughter of innocence... A happy amalgam of Himalayan ritual music, avant-garde atmospheres, and the penetrating, processional drones of the Orgies Mysteries Theater. Bravo!" "There are places on this planet where the landscape dwarfs the sky. 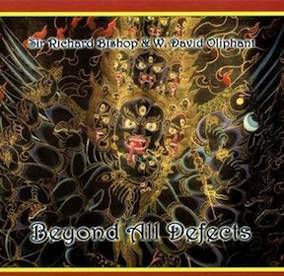 With Beyond All Defects, Sir Richard Bishop and W. David Oliphant have conjured something that is vast in its proportions and simultaneously microcosmic in its detail, pinpointed as if with a kila. Incorporating track titles that reference Tibetan Buddhism and swathed in the imagery of its meditational pantheon, Beyond All Defects weaves a world of sound into a music riddled with allegorical location recordings, sublime frequencies, and the low sonorous trumpeting of dungchen, the Tibetan long horn. Bishop and Oliphant have created something extraordinary, a thing outwith of the conventions of the contemporary avant garde (and yes, the avant garde rapidly adopts its own conventions), and something infernal and translucent that has a resonance as ancient as the far valleys through which we would wish to walk without fear if we could. Go, stride those places with them."